Continuing on our recent blog theme exploring food holidays, we’re diving into our archive of sausage recipes in honor of National Sausage Month. Traditionally, sausage is grilled in link form, deliciously crisped and heated to perfection over the flames, served in a fresh bun. But this October, we encourage you to celebrate this food holiday by trying something new—think outside the casing and re-imagine sausage on your grill. 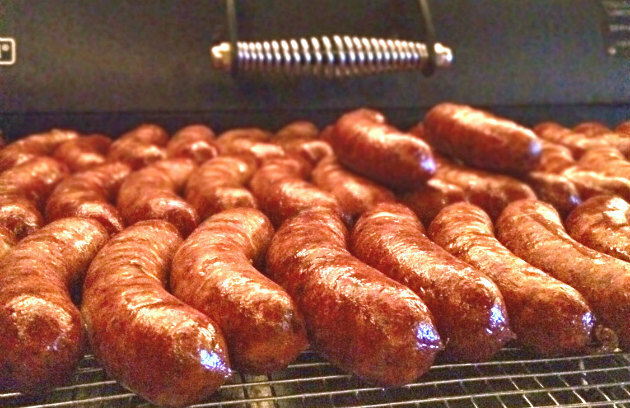 To help you experiment with different ways to cook sausage, we’ve compiled BarbecueBible.com‘s 5 Most Popular Sausage Recipes of 2018 below. By far the most popular sausage recipe on our site, this tubular concoction from Project Smoke calls for a mouthwatering combination of bacon, sausage, and cheese. Pro tip: be sure to follow these detailed instructions for the bacon weave, to ensure the best exterior on your Tulsa Torpedo! We were surprised at first to see gumbo second on the list of our most popular sausage recipes, but after consideration—why wouldn’t this make the list?! This hearty, flavorful gumbo combines the tantalizing flavors of smoke-roasted chicken and smoked sausage with a comforting stew broth. Perfect for the winter months! Currywurst is one of Germany’s most beloved street foods, and is not to be missed. For a more traditional German dish, look for weisswurst at German-style delicatessens and many supermarkets. Or for an interesting nontraditional variation, use Wisconsin-style bratwurst. The only one of our sausages on this list that is served on bread, this sandwich is a stunner. Steven recommends assembling the sandwich with all sausage links in a row, with 2 baguettes positioned end-to-end, so your guests can admire the sandwich whole. When you cut portions for serving, they’ll be just as wowed by the flavorful combination of peppers and seasoning. This recipe from BBQ USA is a work of art, and tastes almost as good as it looks. If you’re planning to make this for a crowd (especially for an event like a tailgate), small grill rings are worth an investment to hold up the apples and simplify the process. Find our October is Pork Month blog here, for 5 stellar pork recipes you should check out today. And check back and follow along as we celebrate more October food holidays each Friday this month!